Get the facts and then go on to gorgeous DIY results with this inexpensive alternative to hardwood. Once reserved for subfloors and sheathing, construction-grade plywood is now making a splash as affordable residential finish flooring. There are two basic ways to go: Remove the existing flooring, such as carpet or vinyl, and then refinish the plywood subfloor beneath, or install new plywood, cut into planks, squares, or even small shapes to form a medallion design, atop an existing subfloor. Whichever route you choose, if you take your time, pay attention to detail, and apply a tough topcoat such as polyurethane to stand up to everyday foot traffic, you can create a stunning, one-of-a-kind floor. • While hardwood is solid all the way through, plywood consists of multiple thicknesses of thin wood veneer, layered at angles, and then glued and compressed under heat to form a strong laminated sheet. The layering process makes the end result resistant to expansion—giving it an edge over hardwood. But plywood’s softer surface has a tendency to chip and dent, making the final application of a hard top coating vital to the success of your floor. • Plywood floors are suitable for any room where you’d otherwise install hardwood, though kitchens and bathrooms are less desirable since frequent water spills are likely. Basements are not recommended for plywood flooring because they’re typically a bit damp, and a concrete floor can transfer moisture from the soil to the plywood, which could cause it to delaminate and swell over time. • A 1½-in thick, 4-foot by 8-foot sheet of CDX plywood (the kind used in subflooring) sells for around $15. Higher grades of plywood are available, but they’re more expensive and intended for finish cabinetry. If you have your heart set on using high-end plywood with an oak veneer face, expect to pay between $50 and $100, or more, per sheet, depending on the quality of the veneer facing. 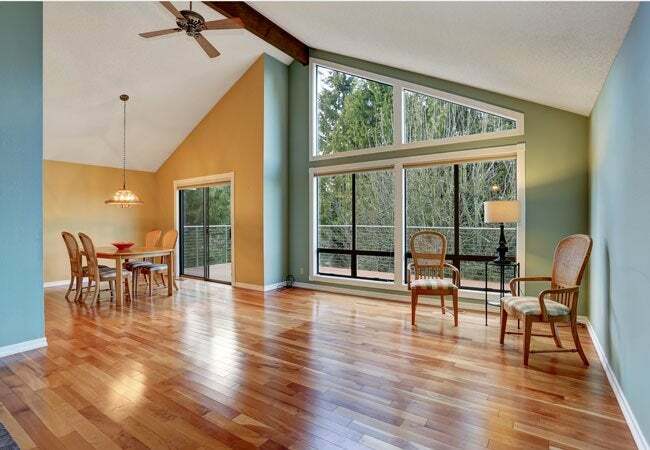 Consider these various ways to create incredible plywood floors. Paper bagging: This finish involves applying irregular-shaped pieces of brown kraft paper to existing plywood for a marble-like appeal. It can be a great fix after you’ve torn out old carpet and are wondering how to treat the plywood subfloor. You’ll fill and smooth gaps between plywood panels with fast-setting drywall compound and a trowel. Then, torn pieces of brown kraft paper—soaked in a mixture of watered down glue—is applied. After the paper layer dries, add a stain followed by a protective finish. Check out our complete guide on how to create a beautiful paper bag floor finish. Wallpaper as floor paper: For this stunning DIY finish, fill and smooth gaps in the plywood subfloor with fast-setting drywall compound and a trowel. Then put down wallpaper in your pattern of choice, followed by three or four coats of polyurethane or other clear hard floor finish. You could cover the entire surface as you would a wall, or cut wallpaper strips to imitate the look of an area rug, complete with a border around its perimeter. Perfectly painted plywood: Create a classic checkerboard pattern, go for stripes or circles, or mimic cobblestones or bricks. The sky’s the limit when it comes to design and, since your painted plywood floor will be covered with a few coats of polyurethane, you can use virtually any paint, even artist-type paints for special details. The key is to prep the plywood floors as discussed above, plus a coat of primer prior to painting. Primer ensures the paint will adhere and also help seal down any loose plywood chips. 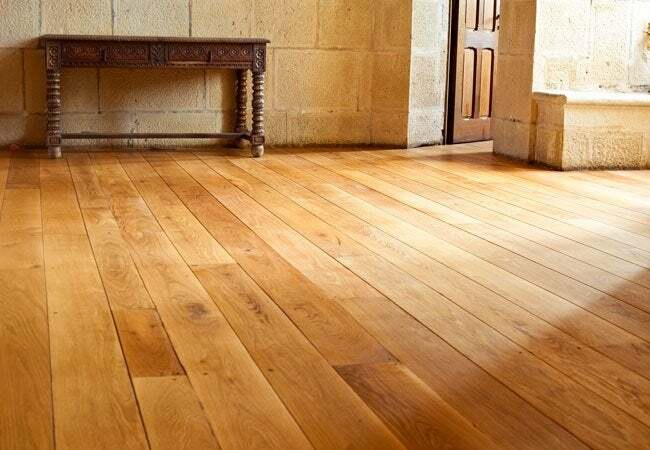 Planks, squares, and other shapes: Hardwood planks are expensive, but you can achieve that natural woodsy appeal by cutting sheets of plywood into planks, squares, or other shapes, then gluing and/or nailing the pieces to the subfloor. If you buy CDX plywood to finish a 10-foot by 10-foot room, you’d need four ½-in. four-by-eight sheets, at a cost of approximately $65. Add $10 for 1½-in finish nails, $15 for the subfloor glue used in installation, $10 for stain, and $15 for a gallon of polyurethane, your grand total would be about $115. The cost for hardwood, tile, or carpet for the same size room could run from $500 to well over $1,000. • You can treat planks with wood bleach for a sun-kissed, weathered look, or stain them to match furniture or trim. 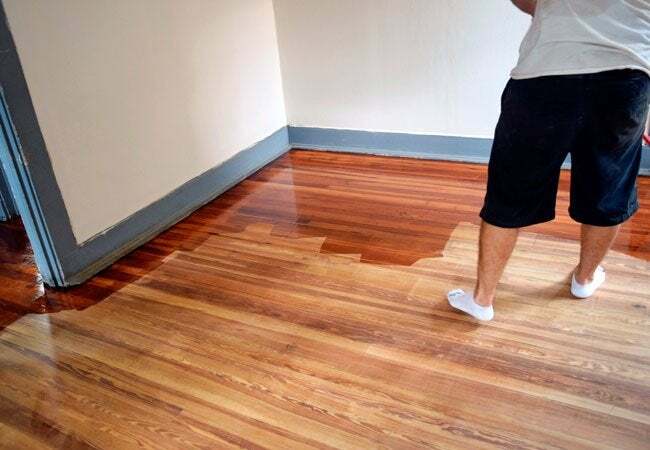 If you choose to stain plywood floors, however, apply a sanding sealer to the surface of the planks first, which will help the stain penetrate evenly. Skip the sealer, and you’ll almost certainly end up with blotchy planks. Creating finished plywood floors isn’t an overnight project. You’ll save money, but you’ll need plenty of time to complete the project. When you’re done, you’ll have a durable, uniquely designed floor you can take pride in.